So you haven’t looked at a map of the world since 5th grade, what’s the big deal, right? Well, did you know that generally, Americans of all ages have some of the worst geographical awareness of the world? Perhaps because we are isolated from the numerous regions/countries/hotspots on the planet, and because most of us are not international travelers, geography takes a back seat to our attention. But how embarrassing when we are in a social situation, and a question comes up about current events, or history, or someone’s recent trip to Israel or Guatemala, and we are stumped by our lack of knowledge! It’s pretty easy to get back in the game, and have at least a general awareness of how the world is laid out. Families can tack up an inexpensive world map, or pull up a virtual map on the internet, or get a shower curtain with a map of the world on it (my favorite), and pose a challenge to each other to locate a spot. Take turns and see if you can stump each other. Madagascar? Baffin Bay? Reykjavik? The winner gets bragging rights; but really, everybody wins when everyone learns something new. No family handy to bounce off your geography smarts? Challenge a buddy to a game. 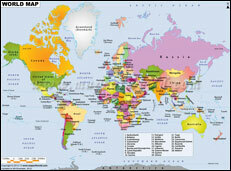 Give each other a name on the map to find, and see how long it takes (cheating is okay; use an atlas or the internet). Before you know it, you will have increased your geographical IQ substantially learned how to use an atlas, or increased your online skills! I once knew a couple who boasted that they had been to every country on the African continent. That sounds geographically savvy, right? Because someone in the party was geographically savvier, they were asked, “Have you been to Cabinda?” They immediately ran for their Atlas, alarmed they had missed one, and you know what? They had! Geography presents challenges and surprises literally, everywhere! Challenge yourself to learn more about a geographical region; it helps the world layout make more sense. And, by the way, Malawi is a tiny country on the southeast part of the African continent. This entry was posted in Uncategorized and tagged education, geography, maps by ccld. Bookmark the permalink. Everyone has heard of Madagascar, but I never knew its location. Or other exotic-sounding names, Marrakech, or Zanzibar? And Cabinda, the little country my globe trotter friends overlooked, is nestled somewhere within the coastline of Congo. It is actually a province, but retains separate representation on the map. ← Previous Previous post: Looking for a Job? We have resources that can help!